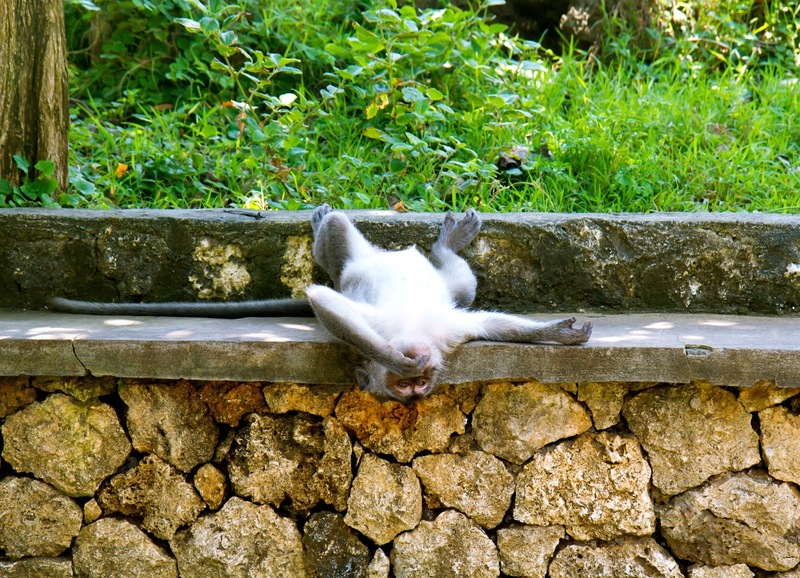 Uluwau Bali: Home to beautiful views, endless blue oceans, wild monkeys and some of the scariest taxi drivers ever. 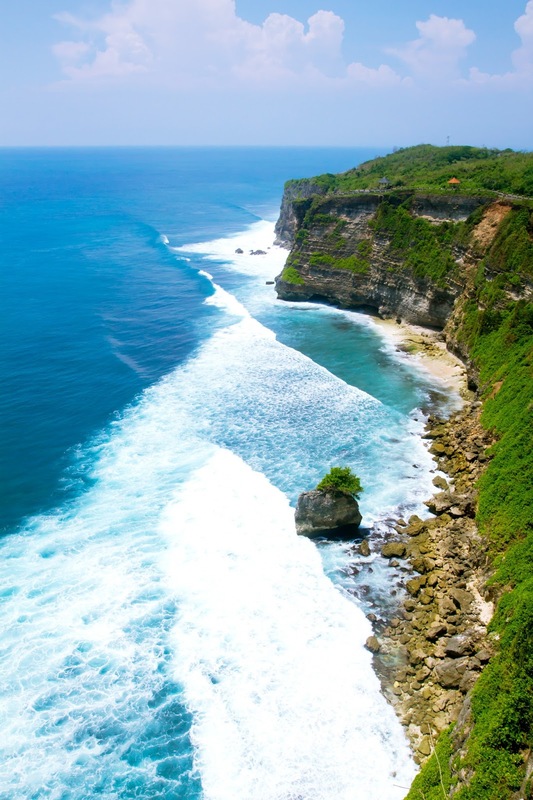 Uluwatu was one of the places on the top of list of things to see while in Bali. 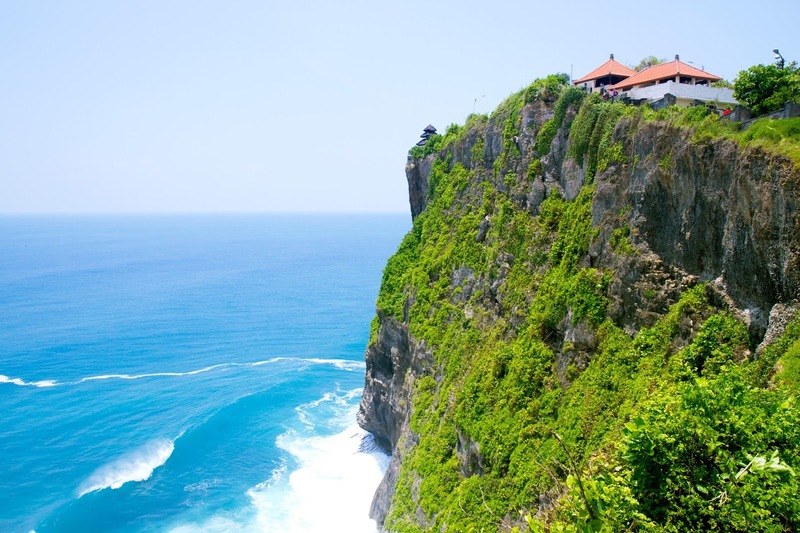 It's a temple on the top of a cliff overlooking the most beautiful blue water below. The views are absolutely stunning and there are wild monkeys wandering around the jungle and the grounds. When you arrive, you are given a blue or green skirt to wear over your clothes (they don't seem to mind about sleeveless tops, luckily) and a warning about keeping your valuables close so that the monkeys don't steal them. I was wearing sunglasses and one of the guards told me to take them off because "the monkeys know". The views really were everything I had imagined. Steep cliffs, turquoise blue water, and untouched shorelines with wave after wave rolling in. We only got a few photos because it was so stinking HOT. The blue skies definitely added to the beauty of the place, but they also made it extra warm and without a hint of a breeze, we were pretty much drenched in sweat within 5 minutes of arriving. The Chinese tourists had it right with their parasols -- I was seriously wishing I had one too! If you are headed there, I would recommend bringing a hat or a portable fan or something (a fan would have been amazing!) because you don't want to be like us and rush through the place. It deserves your full attention. To get to Uluwatu, Ollie and I did our usual and called Uber. When we were getting close, our Uber driver tried to warn us that drivers aren't able to get back in to pick us up as only local taxis are allowed. He offered to drive us around for the day for about $30 CAD, but we thought that seemed a bit high and with his broken English, he wasn't able to fully explain the situation and get the message through to us. So instead, we got dropped off and had a little wander around without thinking much of it. When were were ready to leave, we took the Uber driver's advice and walked out of the grounds to be picked up at a nearby restaurant (as we knew he could get into trouble for picking us up on the grounds). We had a driver accept right away and he showed up about 5 minutes later. As we were walking over to the car, a local man beat us to it and started telling our driver he couldn't be there. I tried to get into the car, but he blocked me from entering and slammed to door shut. He said we had to use the local taxis and Uber wasn't allowed. The driver was clearly scared (we heard later that this can get quite violent) and he apologized to us and drove off. So there we were, stuck without a driver and faced with this man who was honestly quite scary, telling us that we have to use one of his taxis. I'm not sure what the smartest thing would have been to do here, but when I say "local taxis", what I mean is unmarked black vans with tinted windows and sketchy looking men that have just threatened someone right in front of us. And so, we opted to not get in the car with one of these men for the 1 & 1/2 hour ride back to our guesthouse and thought we would walk away from this area until we found somewhere safe to call another Uber. It turns out that this plan was flawed because the road leading away had no turn-offs for quite some time, and said scary men decided to follow us as we walked away. They were constantly driving past in their dark vans yelling out "taxi" and others were following us on scooters -- presumably to make sure we didn't call another Uber. We walked for quite a while until we found a driveway leading to a resort that was hidden from the main road. We started walking down the driveway until we were out of sight and took out our phones to book the Uber from there. A second later, a man came by on a scooter and stooped right next to us. He had a sickle in his belt and was clearly threatening us. We didn't stick around to see what he wanted and headed straight back for the main road. We finally ended up at a resort and used one of their drivers to take us home (for about 4 or 5 times the cost of the Uber and that was after some serious negotiating on our part), but the moral of this story is to have your transportation figured out and ready before you head there. Most people seem to go on tours or drive themselves on scooters. Either one of those would be a good choice and at the end of the day, I wish we had taken that Uber driver's offer to be driven around for the day. We spent that much anyway and we could have saved ourselves a lot of hassle and even checked out some of the beaches in the area. Instead, I don't think we'll be headed back to Uluwatu anytime soon and have been left with a sour taste in our mouths over the whole thing. Such a shame because those beaches are meant to be stunning.